What has happened since is miraculous. 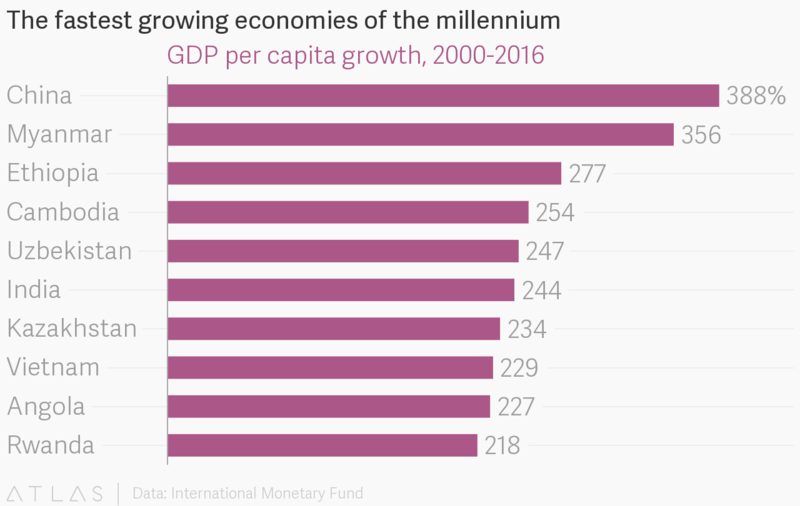 According to IMF estimates, from 2000 to 2016, Ethiopia was the third-fastest growing country of 10 million or more people in the world, as measured by GDP per capita. The country’s poverty rate fell to 31% by 2011 (the latest year Ethiopia’s poverty level was assessed by the World Bank). The outlook for the next five years is bright. In its latest global forecast, the IMF projected that Ethiopian GDP per capita would expand at an annual pace of of 6.2% through 2022—among countries with 10 million or more people, only India and Myanmar are expected to grow faster. Any country making such progress would be cause for celebration, but because of its size, swelling population, and the depths of its poverty, Ethiopia’s gains are particularly heartening. By 2050, the UN expects the country to grow to 190 million people, from around 100 million today, making it among the fastest-growing large countries in terms of population, too. he 1970s and 1980s were a period of political and economic turmoil in Ethiopia. The country was led by the brutal military leader Mengistu Haile Mariam, and during his reign the country faced civil war, famine, and failed socialist development policies. Since 1991, the country’s political situation has been relatively stable, and rising living standards have followed. Still, Ethiopia faces a variety of issues. Though the current government has overseen a growing economy, it has suppressed dissent, and there are concerns it favors certain ethnic groups and regions of the country. More than 500 people died in clashes between the police and ethnic groups protesting the government’s creeping authoritarianism that began in late 2015. More recently, confrontations between ethnic Oromos and ethnic Somalis in the southeast of the country led to at least 30 deaths and 600 displaced. If the country is able to overcome its political instability, the economic opportunities are immense. An increasingly educated population, improving infrastructure, and investments from China, give Ethiopia the chance to maintain its place among the world’s brightest development stories.